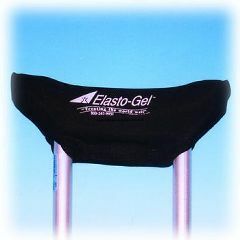 Crutch-Mate Crutch Arm Pads are unique crutch pads made from a high glycerine gel designed to prevent hard spots. Crutch Arm Pads will help prevent friction, reduce chance of skin breakdown and provide long lasting comfort. If I need crutches, this is a MUST! Safe. Stores Easily. Easy To Use. Well Constructed. Supports Weight. Lightweight. Short Term User. I broke my foot.. Product slipped onto arm of crutches, releived pressure underarm and felt so comfortable like a cool pillow. Supports Weight. Safe. Well Constructed. Easy To Use. Lightweight. Stores Easily. this was a great product really help with pain under arm. its now gone .anyone would be gald how much this helps . Indoors. Long Distances. Outdoors. Short Distances. These are great! The relief to the pressure under my arms has been wonderful. These are a miracle for shoulder pain. Easy To Use. Lightweight. Stores Easily. Safe. Well Constructed. Supports Weight. Indoors. Long Distances. Outdoors. Short Distances. Wet Weather. My husband's shoulder was hurting from using his crutches. So I ordered him this product and he said the pain has gone away and his crutches are now more comfortable to his shoulders. Thanks. Good cushioning. Easy To Use. Stores Easily. Lightweight. Safe. Well Constructed. Supports Weight. Long Distances. Short Distances. Indoors. Wet Weather. Outdoors.